Let's go ahead and begin with a very simple form. So go ahead and move our resource pack directory and in the third folder called forms and sessions, let's open up the first step which is called test dot php using data from a form dot step. Go ahead and copy all of this code and paste it over the code that is currently in your test dot php file and save it. Now, before we look at the code itself, let's look at the demonstration. So I'm going to jump to the browser, and I'm going to refresh my test dot php file. Here is the form. It says, "My string" and then there's an input and then a submit button that says "Display the string. " So if we go ahead and type "hello" and we click display the string, it says, "Your string was: Hello. " If we type something else and click display the string, you'll see that new text here. Okay, so let's go ahead and jump back to the editor and take a look at the code. So in this first sign, what we're doing is adding a PHP comment. You see an opening PHP tag, but we also have the closing PHP tag at the end. The reason we might want to do something like this instead of using an HTML-based comment is an HTML-based comment will show in the source code whereas a PHP comment will disappear when the HTML is rendered. We have some HTML here and then we have some PHP down here. 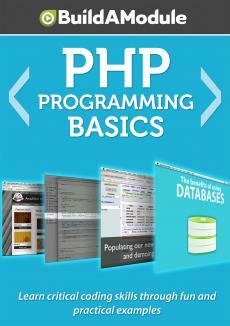 This HTML is simply a form, and the PHP here is processing the data from that form. So form structure, if you are not familiar with it, includes at least an action attribute and a method attribute. The action tells this form where to submit the form. So this is the actual file that it will submit to. You see that it's test dot php here which means that when we submit this form, it's going to submit this form back to the page that rendered it. Now we could use a separate file for the processing, but there are some advantages to having the form and the processing in the same file, and you'll see why as we proceed. The method attribute tells us how to pass data that gets submitted with the form. And there are two options. One is GET and another is POST which we'll explore later. Using the GET method, we'll put that data in the URL. So if we jump back to the browser, I'm going to go ahead and go back right now, and we look at the URL up here, you see we're at test dot php and then there is a question mark which indicates the beginning of a query string and then it has a set of variables based on what got passed to it through the form. So we have my string equals something. So something is the data that got submitted; my_string is the name of the input here.